Watada Court Martial Ruled a Mistrial! Lt. Ehren Watada‘s defense team will have to persuade a judge that the Iraq War is illegal when a new trial convenes next month. The court martial of Lt. Ehren Watada ended unexpectedly today with the judge declaring a mistrial due to his misgivings about a pretrial agreement. 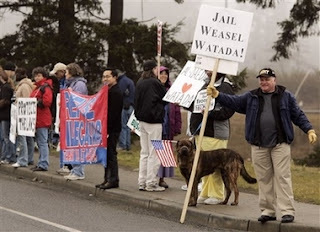 In that agreement, Watada admitted that he missed his brigade’s deployment to Iraq, an admission the judge said is enough to find him guilty. But Watada, in tense questioning by the judge, Lt. Col. John Head, said he believed he still had a defense, that the war is illegal and would cause him to participate in war crimes. He said he did not see the agreement as evidence of his guilt. Prosecutors attempted to allay Head’s concerns, saying that they, too, did not view the agreement as an admission of guilt. But the judge was not satisfied and told prosecutors that there was now a misunderstanding over the agreement. Head said the prosecutors could move to reopen their case which had already been completed on Tuesday. However, they declined to reopen the case, which would have been complicated by the jury already seeing the agreement that now had problems. Michelle Malkin has more on the Left’s definition of a hero.